I love the Sheena Douglas snowflake embossing folder. Those snowflakes are just gorgeous on it and coloring the solid part of the embossing folder, really makes them pop. Love all of Tim's bits... and paired with Quietfire Design Xmas quotes - matches made in heaven. Wonderful, thanks for playing along with us at CCCB! That's a beautiful gatefold design, Yogi! I was very interested to see what it looks like closed, and I see it is just as beautiful closed. Very interesting and pretty! Stunning card, you have certainly put a lot of love into this card. Thanks for joining us at Perfectly Rustics. So cute and pretty Yogi. Thank you so much for sharing your lovely creation with us at Through the Craft Room Door. What a great card! I love the scene you created! Thanks so much for playing along at CCCB!! Beautiful card love the style and the scene you created. Beautiful. I love this card I am so glad you played along at Aud Sentiments. It was a joy seeing your card. Stunning. Dear Yogi you should totally have a BIG GRIN with this card! It's AWESOME!!! Well done, all the little details are super and we thank you for joining with us at Perfectly Rustics! The secene you created is gorgeous/ And you got me with the deers; my favorite animal:) Thank you so much for joining us at CCCB! Such a wonderful winter wonderland scene you created. I love the whole thing it's just gorgeous. Thanks for joining us at Crafty Sentiments. Fabulous forest scene, love those deers. Thank you for joining Sassy Studio Desings, good luck. Hello dear Yogi!! 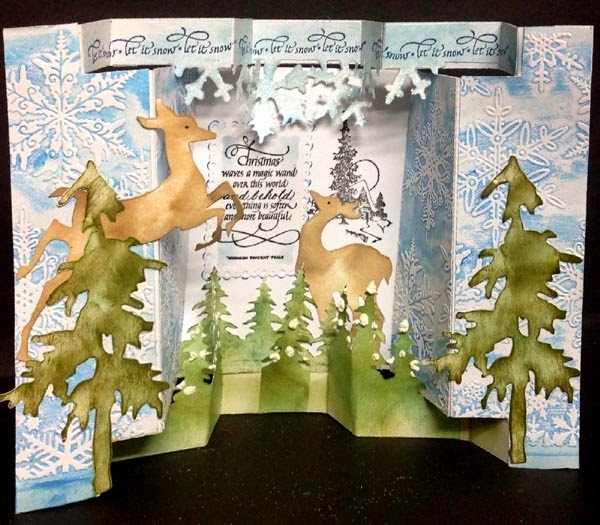 This card is soooo totally wonderful that we all agreed it was a RUNNER up for our holiday Perfectly Rustics challenge!! Well done dear lady! COngrat's to you!! Smiles Sharnee and the design team!